In preparing for my next piece for As Was Written, I’ve been reading a lot of Kurt Vonnegut lately. Thanks to his entertaining wit, boundary-less imagination and scattered way of piecing together a narrative, he has overtaken George Orwell as my favorite writer. 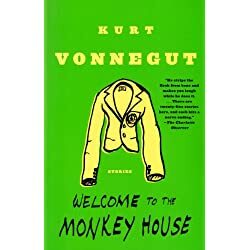 “Welcome to the Monkey House” is the best collection of short stories I’ve ever read. I’d like to think that in my writing, I add a bit of humor mixed with an interesting narrative. I tend to gravitate to other writers who do the same. They’re fairly simple, but infinitely important. “Sound like yourself” especially, since it’s easy to try and write in a different style that isn’t natural. Readers can sense it if they’re used to reading your work. At my events, I read and perform my pieces, so it’s important that as I deliver, I’m not caught stumbling or in a place where I feel awkward telling my story. The audience will know. Very important advice from a talented professional. Take heed.